Singscope is a tool for checking the pitch of your singing. 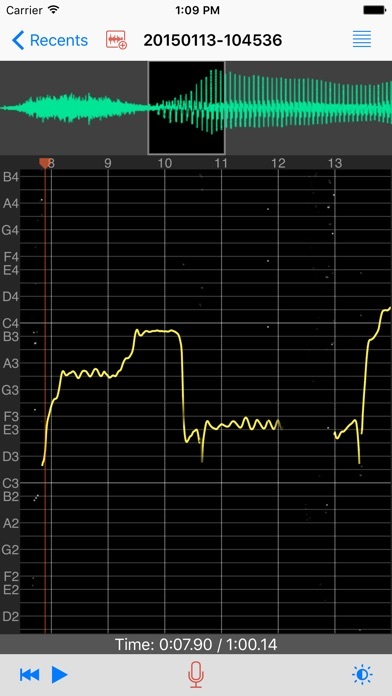 It analyzes the singing voice and shows the pitch in the music scale (C, D, E, F, G, A, B) as function of time. You can visualize your pitch and singing features, such as vibrato, in the scope. Simply tap on the microphone button and sing to your iPhone, iPad, or iPod touch, and watch the pitch curve showing in the scope as you sing. Please note that there are limitations in this app. It can not handle more than one singing voice or polyphony. It may not recognize voices for certain singing styles. For more information, please visit us at www.singscope.com. Can set tempo (bpm) and do music transposition on the lead sheets. For more information about "Vocal Warm UP Exercises" feature pack, please download and check the introduction in the app.